By forumfish, September 23, 2018 in Jeopardy! To celebrate Jeopardy!’s 35th season, 18 elite contestants will return to the show to play the game as it’s never been played before: in teams! I'm Team Julia. I really liked her and was glad she had more wins than any other human player (because, c'mon, we all know Ken Jennings is some kind of human-android hybrid). I like Brad, but dislike Larissa enough not to root for that team. It's not entirely her fault -- she reminds me of a former coworker who dealt me misery on a big project. Here's the list of teams, as posted by @SuperCam1 in the main thread. I am team Austin. I like him, plus he had the good sense to choose Roger Craig. I have to say I have no memory of Leonard Copper - maybe I'll remember him when the tournament starts. I am finding it challenging to choose a team to root for. There is at least one (and in several cases, two!) contestant I can't abide on each team. I may have to skip this gimmick entirely. I wouldn't miss this for the world: I have high hopes for some really sparkling play, since every last one of these people has a track record and they also have the experience with the game that will prevent technical problems (especially with the buzzer) from getting too much in their way. TOC is by far my favourite tournament of the year. I don't generally root for contestants, certainly not on the basis of their looks or demeanour. So if they have the ability to blow me away with the crazy breadth of their general knowledge I'm definitely there for the entertainment the whole way through. May the best man/woman/android win! I'll be watching. I'll probably be rooting for Jennings' team because I like him a lot, but then I like others too. So maybe I won't root for anyone in particular, just for everyone to be great. So maybe I won't root for anyone in particular, just for everyone to be great. And hope that there are no "Toddler Jeopardy" questions! I'm questioning the order in which the teams were picked as Alex Jacobs has tweeted he was the first one chosen, so that means Buzzy went first, not Colby. I tend to believe the guy who was there! Buzzy did have first and last pick. I think I am mostly Team Austin and Team Ken. I enjoy both Alan Lin and Alex Jacob, but I cannot stand Buzzy or Colby. I can't stand Buzzy. Colby (as with half of them in my opinion) seems to be extremely socially inept. (I am to a degree, so not judging.) Even still, I can see he bugs. But he is a fellow Chicagoan, and so I won't bash. I can't stand Buzzy, Colby, nor Austin. Not even sure I wanna watch this festival of whatever the hell it is. I actually love trivia tournaments and will definitely be watching despite my dislike for some of the contestants. Bumping this since the All Star Games begin today. I loathe Roger Craig, and love Austin, so I am torn. I think the Dream Team would be last year’s TOC. Buzzy (who I love), Alan (whom has charmed me), and Austin. I hope that Ken or Julia win (and Austin and Buzzy lose bigly). I didn't like him at first but I came to really like him sometime during that tournament where he played against Brad and Ken. So I am Team Austin. I am not against anyone so mostly I hope they all do a good job and give us some great games. I don't remember a lot of these people by name, and I'm almost certain Austin's run was during the period when I wasn't watching the show. So, if pressed, I'm Team Julia, just because I remember quite liking her. But I'm really just here for some good competition in a new format. I watched it here in Chicago and it cut off abruptly at the end of single jeopardy. I don’t know if that was supposed to happen but Alex didn’t say anything about we will continue tomorrow. Actually, madding crowd, that is what was supposed to happen. Today was Single Jeopardy only, tomorrow will be Double Jeopardy only. 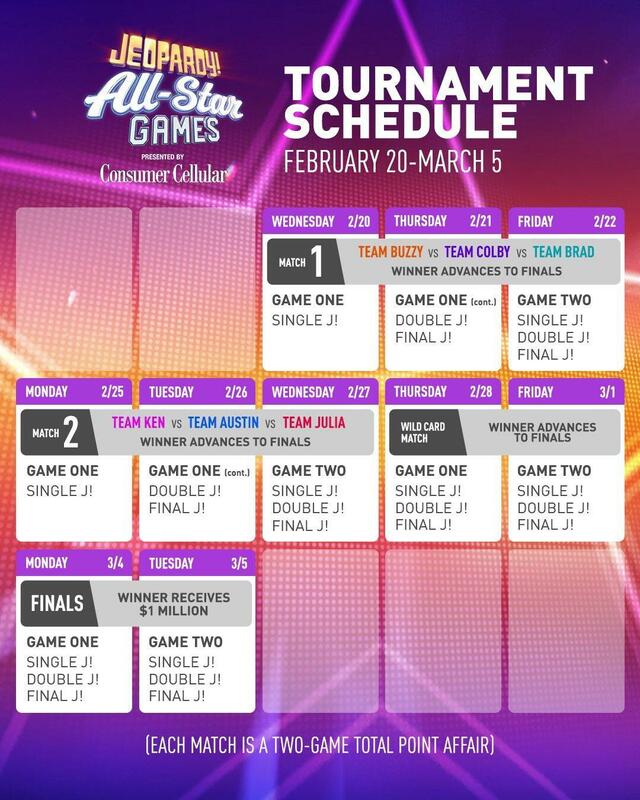 I assume there will be a day of Single Jeopardy only & one of Double Jeopardy only involving the other 3 All-Star teams. Don't know what's happening with FJ. 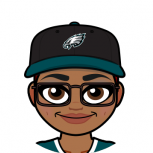 I posted in the main season thread, but might as well here too---maybe we need to ignore the All-Star team days & have short weeks (X/2 this week & X/3 week after next) for the contest. I’m in Chicago and was also confused. Today was just single J! and tomorrow the next group of contestants will do DJ! Alex explained how it works at the beginning of the show but he lost me. Alex explained how it works at the beginning of the show but he lost me. Just now watching the first show of the tournament. I remember that some of those folks annoyed me when they were on, but I'm kind of enjoying how they're trash talking each other. ETA. I'm a little slow and maybe this was explained before, but is the plan that each team has to assign one person each to jeopardy, double jeopardy (is that the right term? ), and final jeopardy? They could have skipped all the extra stuff - I just want to see the game. That was very disappointing to me that it was only single J! and I hated they started at the bottom of the board. I'd forgotten just how much Colby annoys me. For this first match, I'm more or less Team Anyone But Team Colby. I had not forgotten how much Austin annoys me. But the trash-talking was fun. Sooo...what did everyone think of the format? There was so much board jumping that I was getting dizzy & I am still not sure how the game works 🙂 It was fun seeing familiar faces & I liked Colby's emotional response to how he helped his Mother with the money he won. The podiums are too busy, too much to look at. Is it weird if I would prefer if Alex just did all the rounds? I mean actually two weeks of Julia, Ken and Alex would be fine with me. Austin no one was talking to you at the beginning it’s not all about you. That DD was not worthy of a game with these players. Does Colby always swallow the question so it doesn’t sound like he’s doing it right? Also this is my first real exposure to Brad and I have to say I am not a fan. Part of it is that I’m salty that Alex was not leading but Brad is too extra. This episode was so frustrating! I just wanted them to get to the questions already! Also what the hell was Brad’s strategy doing the regular Jeopardy round instead of Double Jeopardy where he could maximize points? Can they not play the same round twice? I guess he’s banking on making the finals and will play double then. I don't mind the trash talking since I am not particularly rooting for anyone and only against a couple of people. I am somewhat confused about how it will all shake out. It reminds me of something called a gatling gun historic base ball tournament I attended awhile back which I ultimately loved so I am hopeful. But it could be a long couple of weeks. Triple Rhyme Time was insane. I don’t see how they got any of them. The rest of the board seemed normal in difficulty. I was wondering if they would make it harder for the all stars. There’s going to be 4 FJ’s during this tournament? Do I have that figured out right? Triple Rhyme Time was insane. I don’t see how they got any of them. I wasn't going to watch, but I need my fix. I admit that I felt pretty smart when I got Gibraltar alter vaulter. I really don't like all the talking and wasn't even sure there'd be a game. It was stressing me out! I kept checking the time left on the recording and freaking out that they'd never get through an actual game. Gah! I think so -- Match 1 has one, Match 2 has one, the Wild Card game has one, and the final has one? Or is the final two games like a normal tournament, and so has two? I kind of hate the format, too, and it doesn't help that I'm still a little confused by how it works, despite the helpful graphics at the beginning of tonight's half game. This episode was so frustrating! I just wanted them to get to the questions already! I agree with you here. I gather from the other comments that some people are enjoying the trash talking, but some of these All Stars seem to have been told to exaggerate their most annoying qualities. I didn't realize from the explanation that they would be playing Single and Double Jeopardy on different days. I felt good getting Greek Peak Week and Gibraltar altar vaulter! To answer how the three-member teams work, one person does Jeopardy round, one does Double Jeopardy round and the third does Final Jeopardy. DJ and FJ will be tomorrow. The intro reminded me how much I dislike Austin. As posted above, it's not all about you. 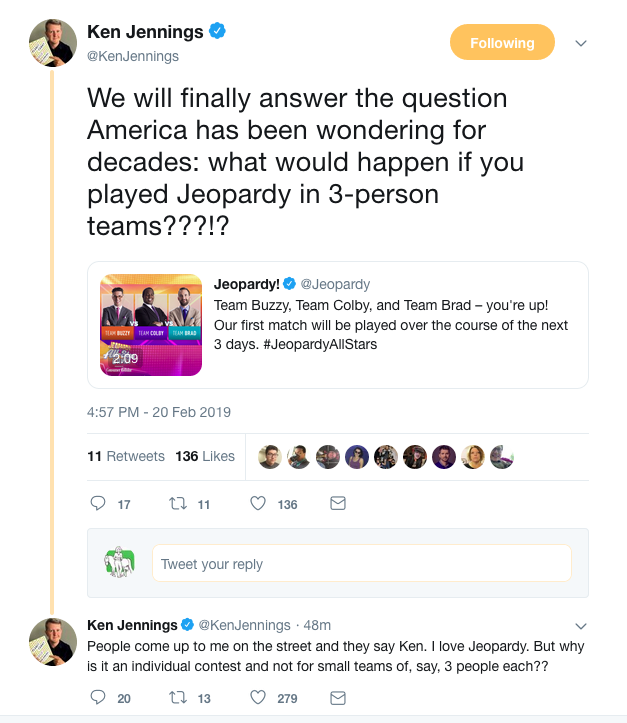 If only you were half as successful in your life as Ken Jennings is in his -- but you're not. You throwing shade on him makes you look more petty than you are, if that's possible. Trebek showed a graphic at the beginning that illustrated how the teams will move forward. There will be two games with three teams each (using the six teams in total); the winning teams from those two games advance to the final. The third team going to final will be the highest scoring losing team, that's the wild card team. So, three teams will compete for the Big Pay Off. Alex Jacobs rocks, Brad was just lucky to find that DD. As for the board jumping, everyone was looking for the DD, that's why the jumping around. The laugh was, DD was a $400 clue, a place none of them expected it to be. I'm not sure how I would feel if I were the person chosen for FJ. But I guess that should be the person slowest on the buzzer. Alex ruled in the buzz-in-first category. If anyone studied the stats when selecting their dream team, percentages of first-buzz-ins were given for every player. So was about every other stat you could think of to grade these players. Colby's interview brought tears to my eyes, then when Alex told his story, I had to get some fresh Kleenex. But I'm sappy that way. I hated Austin's intro. I wish lightning would strike him. He must have been ignored as a kid and has this need to be the center of attention. Or else he WAS the center of attention growing up and now expects it. I hope the other players kick him to the curb. @opus, I think you are correct about the four FJs. But don't quote me. Edited February 21 by saber5055 · Reason: To clarify winning teams so even I could understand what I wrote. I thought there was a ton of wasted time tonight. All the board jumping drove me nuts. I loved the Notorious category it's one I would run if I were on Jeopardy. I just found out only this first round will be over two days, so all the interview stuff could fit in. All other games will be all in one day like what we're used to. Here's something to make it clear. I love pictures. Anyway, I think I'll just use episodes online to tide me over until this tournament ends. I really don't like all the talking and wasn't even sure there'd be a game. It was stressing me out! I kept checking the time left on the recording and freaking out that they'd never get through an actual game. Gah! I kept doing this too - I was watching a recording just as the episode was finishing up live, so I actually paused to check to see if the episode had run long and if I should be extending the recording out. Whew. Still trying to catch my breath. Going between the good-natured filler interviews and the positively FRENETIC pace of the actual game was messing with my head a lot. On the (small handful of) times I was able to come up with the answer before someone else buzzed in, I felt like a superhero. The questions were crazy hard IMO, the board-jumping was all over the place, and there's a good reason there's usually only one (or fewer) dominant player at a time in this game. It felt like I'd done 1000 jumping jacks by the end. too much talking today but I understand since they had to explain to people how this thing works. also the team i'm rooting for is team Brad cause of Larissa. 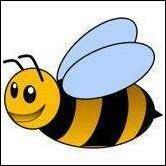 I'll join you all in the Austin hate, but I like Buzzy. I think he's actually funny, in an awkwardly endearing way. Unlike Austin, who only thinks he's funny. Also, have they given up dinging people for not saying "What is?" Colby did it right off the bat and I was sure they would call him out on it, but nope. I don’t hear Colby say “what is” either. Does the winning team split the million, or just the winner? I really liked her when she was on, plus I either don't remember or can't stand <glares at Austin> most of the other players. I am happy to see that Colby bought a suit that actually fits, and I did like his story about his mom, but he still irks.